Irish economist A.P. O’Malley has studied the global economy for a quarter of a century, and being Irish he also found himself compelled by it to make a life here in the U.S.
There’s nothing quite like economic displacement to open your eyes to the fact that everything is connected, since the hard lessons of immigration have a good deal to teach us about profit and loss, after all. Unlike many other free market analysts O’Malley -- who earned a business degree at University College, Dublin and an MA at Baruch College in New York where he now teaches in the Marketing and International Business Department -- isn’t afraid of wading into controversy. In fact, much of his sometimes pugilistic new book Tempered With Reality: Economic Theory and the Real World seems to invite it, exploring as it does how deliberately arcane derivatives have swarmed the balance sheets of banks, and how governments throughout the world have guaranteed them private profits but have socialized their losses to the taxpayer, putting the global economy at increased risk. If that doesn’t set off alarm bells then you weren’t paying attention during the collapse of the Irish economy and the near collapse of the American one. So O’Malley’s timely book could serve as a primer to bring you up to speed concerning where we are and how we live now. In particular, O’Malley examines how tried and tested economic theories that achieve what he calls perfect equilibrium in the classroom may no longer apply to the increasingly complex global business and economic environment. O’Malley writes lucidly about how most of the world’s free market economies are now saturated in debt, both government and private. In fact, he writes, most financial institutions are now leveraged more than they have ever been in the past. Sovereign debt was low risk in the past, but now countries like Ireland and Greece have become risky investments, he writes. Deleveraging, or the gradual repayment of the nation’s giant debts, can only occur through economic growth, but the biting austerity programs that lower government spending and budget deficits (hello Ireland and Greece) actually threaten all growth. You can’t get there from here, it seems. So what’s a tiny nation like Ireland to do when confronted by mountainous debt and ever shrinking coffers? The answer, at least initially, has been to introduce stealth taxes, which over 800,000 already strapped Irish taxpayers simply refused to pay. The challenge for Ireland now is the challenge for the free market economy more broadly. How can its economy create jobs, wealth and social stability when the economies are strangled by debt, both private and public? The banks made out like bandits, he writes, while ordinary homeowners ended up locked into mortgages they could not sustain. Recall too that Irish wages never rose alongside property prices, and the lag between earnings and the collapse in housing left tens of thousands caught in equity traps that would ultimately force them to emigrate. Most of them went quietly too, because they always seem to. For centuries emigration has acted like a pressure valve that prevents revolutionary sentiment from taking hold in Ireland. People simply vote with their feet, leaving the system that failed them largely intact decade after decade. O’Malley pulls no punches about the nation they have left behind. The Irish economy is being reduced to an International Monetary Fund controlled colony he writes, where foreign multi-nationals own key national assets due to scandalous government mismanagement of the Irish economy and banking mistakes so monstrous that were then granted guaranteed bailouts. O’Malley also focuses at length on the American economy and the national debt, but in particular his subject is the way in which the middle classes across the nation and across the world are being diminished, financially in terms of employment, and more importantly under political leadership. Taxpayers, he writes, will continue to be held hostage for the mistakes made by reckless banks in the U.S. and in Europe especially. O’Malley’s challenge is that once you understand how the global economy works now, will you be content to sit by and watch the future fall into the hands of those who understand the nature of resources, and control them for the benefit of the few or the many? 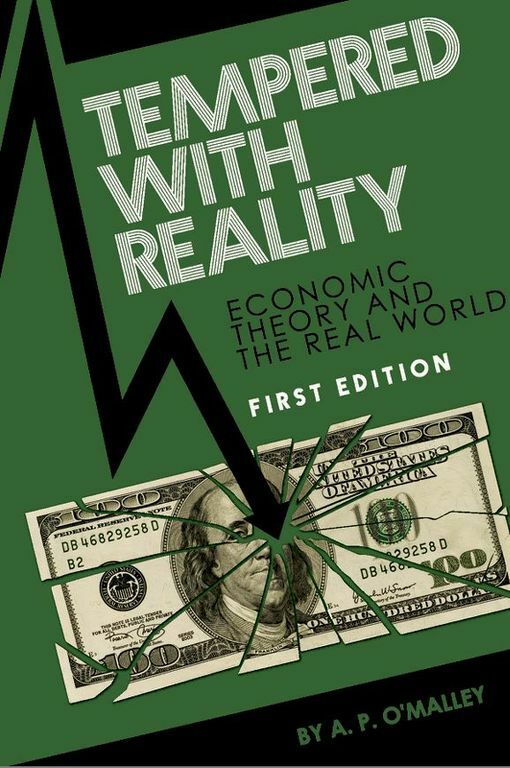 Tempered With Reality: Economic Theory and the Real World is published by Cognella Academic Publishing. The book is available at www.amazon.com and other book outlets.